When I think of Italy, I think of Spring time. My first trip out of the country, was a family trip when I was little to Rome to celebrate a family friend's ordination to the priesthood by the Pope. I remember walking through the streets of Rome, the buildings bedecked in flowers, their scent filling the air. I remember gardens overflowing, the sunshine being bright and new, and the joy of warmer temperatures visible on peoples faces. Here at home, Spring has sprung again for the year. The birds are chirping, the trees are budding and the flowers are blooming. The world is reawakening, and to celebrate, Nespresso has launched two limited edition, Italy inspired, coffees to help us wipe that sleep from our eyes. It is perfection that Nespresso chose Italy for their inspiration for this launch, and has concentrated on the energy of the cities of Trieste and Naples. Trieste has a long history with coffee, serving as the gatehouse for all the green coffee headed towards Vienna. This history has made Trieste a coffee concentrated city, even developing their own nomenclature for the drink. They refer to Nero for an espresso, a Capo denotes a bit of milk added and "in b" means they are serving it up in glass rather than china. This is a city that is serious about their coffee. Celebrating this, Nespresso has created a blend of South American and Eastern Africa Arabica beans. At an intensity level of 9, Trieste is a bold, yet very balanced, flavored coffee with decadent notes of Chocolate and Hazelnut. Trieste is meant to be served as a Ristretto, an espresso with less water, but can also open up its flavors as a Cappuccino. 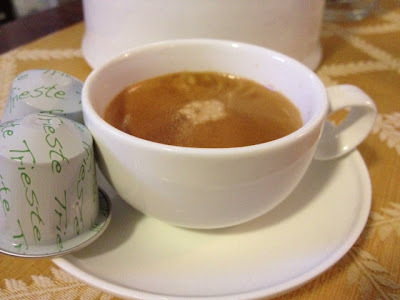 I found Trieste to be a very easy coffee to drink throughout the day, and even as an after dinner drink. coffee is only drunk as espresso, and is sought to be a burst, a jolt. The Nespresso blend brings together Arabica beans from South America, Asia and Africa, in a bold coffee that gives an immediate jolt. I felt my eyes perk up at the first sip. Flavors of black tea leaves even the flavor and create a robust feeling coffee. The intensity level here is at an 11, and it truly is an off the charts. 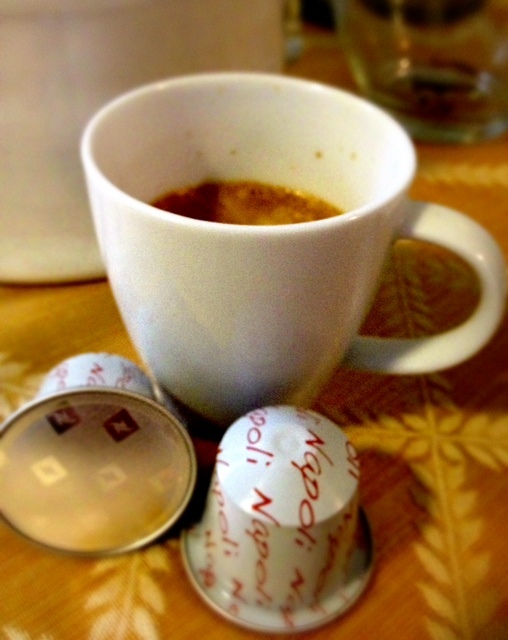 I have been loving the Naples as a pre breakfast drink, clearly bursting my eyes open and readying me for the day. It is spicy, dark and wonderful. The new blends from Nespresso are only open for a limited time, and should definitely be experienced as we push the hibernation of winter out and welcome the brightness of spring.